But we cannot deny that the end result is great once you get the hang of it. Being an all-in-one platform, WordPress has its pros and cons. If you are focused on a specific purpose then too much of WordPress features might just get you all jumbled up. So today we wanted to give out options that are similar in features but are concentrated more on a specific purpose like blogging, eCommerce, or simply website creation! While we are a huge fan of the world’s most used CMS platform WordPress, today we wanted to let our users know about great alternatives to WordPress. For a more clear idea and to get you where you wish to be, we have categorized them into categories! Website Builder Alternatives for WordPress! 1. Self HostedCMS WordPress Alternatives! You surely have heard the name before! 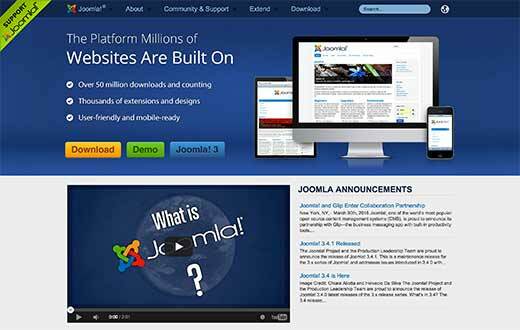 Joomla is yet another powerful and popular name when it comes to CMS platforms. It is free, multi-purpose and is built on the model-view-controller web application framework. Already with millions of users by its side, it will be celebrating it’s 14th year of establishment this year! Although not as widely popular as WordPress, it is equally competitive and is a great alternative! Much like WordPress, Joomla can also be expanded in its functionalities with additional extensions namely: components, modules, plugins, templates, languages, libraries, files, and packages. Each of these serves a specific function and is mostly built by Joomla itself. For a clear comparison, now let’s talk about the pros and cons of Joomla over WordPress! Joomla has several thousands of free plugins available at the homepage. Compared to WordPress, Joomla provides a more multilingual platform as they are baked right into the core. The modules of the Joomla layout are more flexible and can be moved to individual pages or menus. It allows the user to easily manage a site with even hundreds of sub-pages. Most of the URL’s generated are great for better SEO ranking. The Joomla third-party community is not as large as WordPress. Some of the plugins are difficult to run without serious work on PHP. With more possiblities and functions, the interface is a bit difficult to comprehend in the beginning. Joomla is basically in the middle of a spectrum. It is not as developer friendly, nor is it user-friendly. In a nutshell, Joomla is still an awesome WordPress alternative as it is free, offers a number of extensions as well as great technical support! Great for sites with a lot of contents and multimedia sites! After Joomla, another name that pops up as a great WordPress alternative is Drupal! It is also an open-source CMS that you can use to deliver a more ambitious digital experience. Although it is suitable for almost everyone, it is not as beginner-friendly as users would prefer. 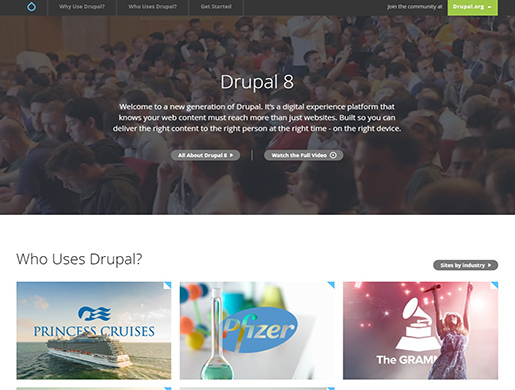 Mostly recommended for experts, Drupal lets you create blogs, personal websites, forums and even social networking sites. While there are modules and themes that extend the features and looks, novices find it a bit difficult to create a detailed site with it. However, the complexity of Drupal is appropriate for handling huge amounts of data. This makes it ideal for larger corporate and enterprise websites. Just like in WordPress and Joomla, Drupal also allows various extensions in the form of modules. But the difference here is, unlike WordPress users need to leave the system and manually search for the modules before installing them. Having said all this, let’s take a look at the pros and cons of using Drupal as a WordPress alternative! Ideal to create highly advanced websites. Drupal allows rapid prototyping which helps to create a complex site in a short time period. You can easily handle non-English sites by activating the modules that are in charge of the languages. Once you get the hang of it, users realize it is highly extensible. You can use contributed modules or start entirely on a blank slate, you can extend Drupal as you see fit. It is not ideal for beginners and novices because of its complexity. If not tweaked properly, Drupal might consume a lot of time and resource. The blogging modules are not as good as in WordPress. Installation is not as straight-forward when compared. In a nutshell, if you are thinking of creating a complex website or working on web projects that WordPress can’t handle; then Drupal is the right choice for you! Although not as beginner-friendly, it definitely is more secure, offers more extensibility and is great for larger scaled sites. 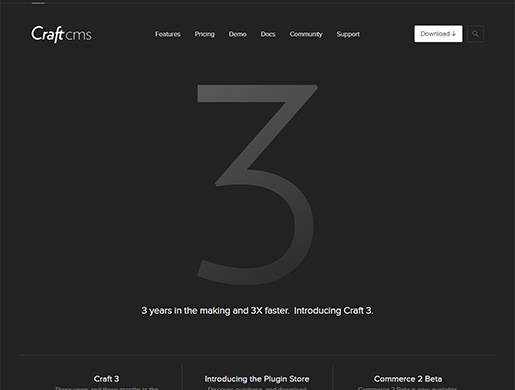 Although not so popular among the users, Craft CMS is an effective content management system. Some major examples of this are Netflix and Salesforce websites. It is a much more complex and developer friendly CMS platform that provides exclusive back-ends for your websites. Unlike WordPress, it does not provide front-end themes that you can use. Instead, you can use their templating system that is powered by Twig to design it yourself. It is also much more flexible and extensible than WordPress. The best part is also that unlike WordPress with predefined content type, it allows the user to set up their own content type using 18 different types of field. But like we mentioned before, this is not the perfect place to start if you are looking for a simplistic website and are a beginner. But to help you get a bit more insight into it, let’s talk about the pros and cons of Craft CMS! Flexible content fields that can be added as entry fields to build the perfect interface with ease. Developers have complete control over how each element is placed and ordered. Unlike WordPress, users can view the admin console as well as the website side by side along with the changes they make as they go. The admin can group users together and decide to restrict or enable users to access specific features. This aspect is similar to WordPress. Craft CMS supports multiple environments which means that you can develop the site locally, deploy to staging and also to production. It is not suitable for smaller or simpler websites or beginners. Craft CMS requires payment to enable separate client logins, unlike WordPress. The plugin collection is not as huge and you require to code your solution. Being a new project compared to others, there might be stability issues, bug fixes or changes. In a nutshell, if you are a developer or an expert Craft CMS gives you the flexibility and and extension you may find useful. Everything can be optimized as much or as little as needed and is an ideal WordPress alternative! 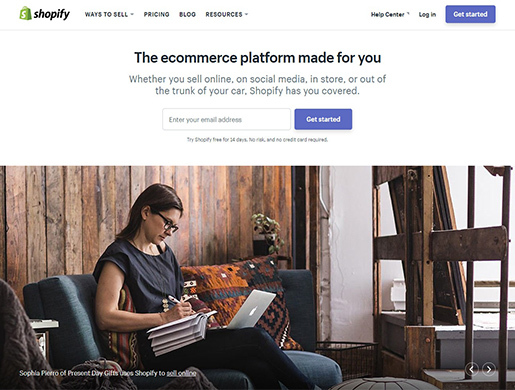 When we say online business and eCommerce, the first thing that comes to mind is surely Shopify! It is an amazing alternative to WordPress that allows any users to easily create your online shop! It is a simple, secure and stable platform where you can start and grow your business with very less effort. While comparing with other web hosts, it surely does not offer the same level of robustness. However, it is best known for its amazing eCommerce based features more than anything else. Being extremely flexible as well as user-friendly, it enables any entrepreneurs to focus on their products and it’s promotion. 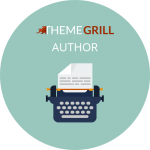 It is relatively easy to manipulate and use and offers hundreds of free and premium themes to choose from. What’s great is that Shopify also offers the user the option to sell their products through social media, by integrating a Buy Now button or even using the POS system. Now, let’s dig in a bit further and talk about the pros and cons of using Shopify! Option to showcase an unlimited number of items because of unlimited disk space. Easily integrate PayPal or simply use the Shopify POS for an easier payment transaction. Advanced reporting and real-time shipping option available as well discount codes option. 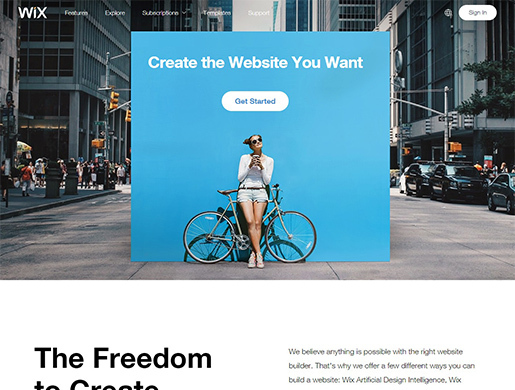 Free Website builder with tons of options for themes you can choose from. Shopify is not as flexible as WordPress and is fully focused on eCommerce purpose. There are no options to extend the SEO of any content with plugins like with WordPress. Blogging functionality is not as efficient as WordPress. Simply put in a nutshell, it is the ideal eCommerce alternative for WordPress that gives you everything that you need to run a lucrative business online! 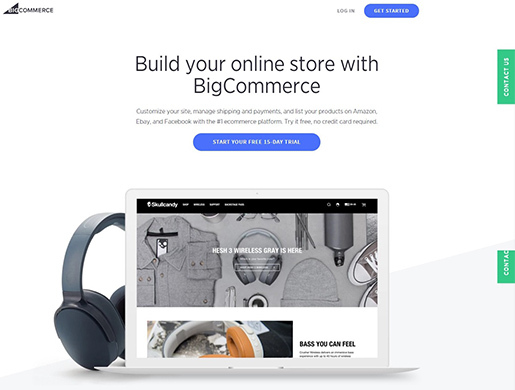 Another big name when it comes to eCommerce platforms after Shopify is BigComerce. It is a hosted e-commerce solution that allows the users to set up their own online store and sell their stuff. It is flexible allowing anyone from beginners to experts to use the services and create the ideal platform. Compared to WordPress however, it is not ideal for other types of sites. It also includes hosting, themes as well as apps to help you get your site up and running. Although not as advanced as WordPress blogging platform, the blogging capabilities of BigCommerce is pretty great. It is easy to use and is secure as it is protected by multiple layers of security. Managing and running an efficient and successful online shop is easier and we can say that it is a pretty great alternative to WordPress in this niche! However, to get an idea of what it really has in store for us, why not go through the pros and cons of using BigCommerce to set up and online store? Allows the user to easily sell items outside your store on other sites like eBay, Amazon as well as Google Shopping. Unlike Shopify, BigCommerce does not require any transaction fee making it more ideal for store processes. 99.99% Uptime guarantee which makes sure that your store is up and running every time. Option to add shipping quotes with real-time rates from USPS, UPS, FedEx and more. Extremely secure with multiple security layers including PCI compliance. The premium themes available are more expensive than users anticipate. The theme editor is not as advanced as WordPress or Shopify. Pricing plans are comparatively more expensive. The blogging platform is not as good as WordPress. Comparatively, BigCommerce is a good competitor and alternative for WordPress when it comes to eCommerce niche. However, the pricing and expensive themes might not be ideal for everyone! 3. Website Builder WordPress Alternatives! Wix is one of the most popular and widely used site builders that has already managed to make a name for itself. It was first released back in 2006 and has completed over a decade in the industry. Wix is probably one of the most user-friendly website builders out there thus competing with WordPress. It uses the What You See Is What You Get editors alongside the drag and drop builder which makes the whole process a lot easier. What’s great is that while on other site builders, you can only drag and drop the elements to the predetermined areas or blocks, Wix gives you the freedom to place it wherever you prefer. Another amazing thing about this website builder is that it also enables the users to animate texts and other elements. This surely adds to the efficiency and intriguing factor of this builder. With amazing options and tons of features to get you that perfect website, Wix is a great WordPress alternative as a website builder. With the latest update, you also get the feature ADI. This enables the user to add a website link so that the tool builds the exact website version for you to edit and customize. User-friendly and incredibly easy to use and understand even for beginners and novices. Extensive app market available to find the extensions that will help users out! A long length of features including SEO, blog, website building, social network integration and more even on free plans. Great range and well-designed templates available to choose from. The Post editor and Dashboard of Wix are also user-friendly. Ads are included with the free plans which may cause an unnecessary distraction. Internal URL’s generated are impossible to comprehend. Some of the available templates cannot be modified to the user’s preference. In a nutshell, if you are looking for something else than WordPress to build your website from scratch, Wix is probably the right choice for you! With a user-friendly aspect and amazing templates to offer, Wix is more than just a WordPress alternative! 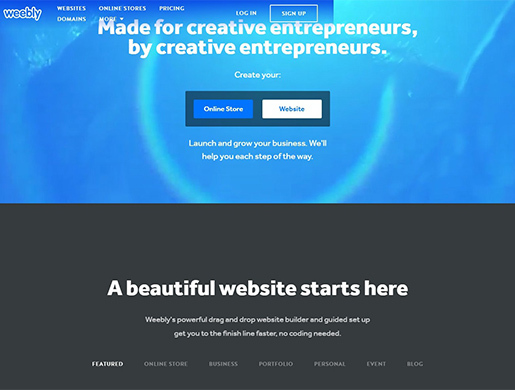 If Wix does not make to your cut, then Weebly is also an awesome WordPress alternative for you. It is a fully hosted online site builder that enables the users to easily create and build the ideal site. Much like WordPress, Weebly also has a selection of tools built-in that helps with various features. However, where it differs is that while WordPress has a huge range of third-party software and plugins, Weebly is not as competent. However, it does make up for it with the stunning and excellent design structure. The Drag and Drop Page builder makes the process as easy as a breeze. When it comes to themes, although the market is not as huge as WordPress, Weebly has a decent amount of amazing themes to choose from and customize. The tools are all super user-friendly and easy to follow. Simply put, Weebly makes a pretty great alternative for WordPress and is suitable for smaller websites. Although not as flexible as WordPress, if you are aiming for minimal and simplistic sites, then it is definitely a good start. To give you a bit more insight, here are some pros and cons of using Weebly! Best suited for beginners and novices for simple projects and websites. The backend, as well as the overall outlook, are functional and user-friendly. Templates available need little modifications to look amazing. Sites based on Weebly have fast load speeds. Onboarding and Education options to help users out. No option to add Custom Content types except within the individual page. It’s difficult to add some advanced marketing tools on your site. If you wish to migrate to other platforms, you need to manually copy and migrate the contents through RSS. In a nutshell, Weebly is a great WordPress alternative if you are looking for an all-inclusive website builder. Offering great pricing plans, good functionality as well as experience, we certainly recommend our users to Weebly! 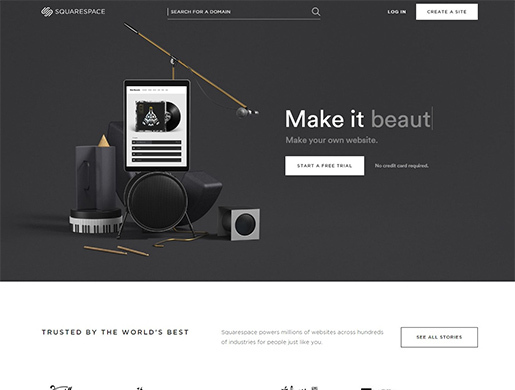 Amongst most of the website builders, another name that comes to mind is Squarespace. The versatile builder for blogs, portfolio sites as well as online stores, has managed to rise in its popularity in the recent years. Despite the huge difference, this being a closed source software while WordPress is an open source; it certainly is a great alternative to WordPress Page builder. That’s right, for the casual users the overall functionality and the flexibility is the main aspect. Comparatively not so advanced, Squarespace is ideal with the simplest method to build a basic website. Unlike traditional Page Builder, you do not need to sign up for hosting, purchase a domain or go through the extra hassle. Instead, you simply create an account on Squarespace and that’s about it. After answering a few more questions on your preference you end up with a working website in a matter of minutes. While it includes a drag and drop builder that you can use to add and customize the elements of the site, it does not provide much control to the users. Comparing the both, here are some pros and cons of Squarespace! No need to sign up for hosting or purchase a domain. Option to create own design using the drag and drop builder based on content blocks. Beginner-friendly interface and easy to follow through. Good selection of beautifully designed templates is available. Best suited for almost every niche of small-scaled websites with a range of useful components. Being an all-in-one platform the sites on Squarespace are secure and has fast loading time. Unlike other website builders, Squarespace does not offer a mobile editor. Lack of support from third-party plugins and extensions. Not so ideal for sites that are e-Commerce purpose defined entirely. Comparatively more expensive plans than other website builders! In a nutshell, Squarespace is a great closed source software that is one of the most well-reknown all over the world. With the ease of usage, it surely works great as an alternative for WordPress website builder! 4. Blogging Platform WordPress Alternatives! While WordPress is pretty much the preferred publishing platform for the mass all over the world, during the recent years, WordPress has become more than just a blogging platform. This is where the WordPress alternative Ghost comes into play. It is a NodeJS based blogging open-source platform that was designed especially for the purpose of online publishing for bloggers. Released not so long ago, this project has already achieved four times more than it originally aimed for. It is preferably more simple, light-weight and is a clutter-free content management system. The flexibility is obviously not great as WordPress. But it is surely an amazing platform if you are willing to forgo the large but complex marketplace of WordPress. Best suited for beginners, bloggers or anyone looking to create a simple, elegant and easy-to-manage website, Ghost can be an awesome alternative for WordPress if you are looking for one! But to assure you of the usability, here are some pros and cons of Ghost! The design of the Dashboard is far more simple and clean. However, any information you might need it is available at your side. The Post editor of Ghost is also more advanced. While editing and writing the content you can view the live preview side-by-side. It is simple, provides necessary tools and is clutter-free. Ghost is extremely user-friendly. This means that any beginners can easily create an elegant looking blog with ease. It is somewhat similar to WordPress when it comes to the download and usage. You can download a free file to build a blog, but you need to pay to host your very own blog. Because Ghost is a newly launched platform, it is still in the testing phase and needs more users to try them out. While Ghost has an array of themes available, there are no plugins developed to install and use. Being designed especially for blogs and publishing sites, it’s not suitable for other types of websites. 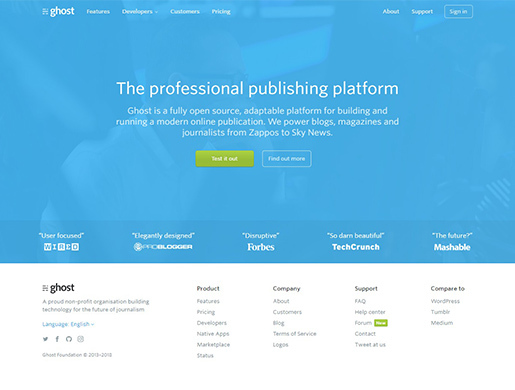 In a nutshell, Ghost is simply the lighter and more simplistic version of the WordPress blogging platform. Ideal for someone looking to skip the unnecessary complexity and focus only on blogging, Ghost is a great WordPress alternative. 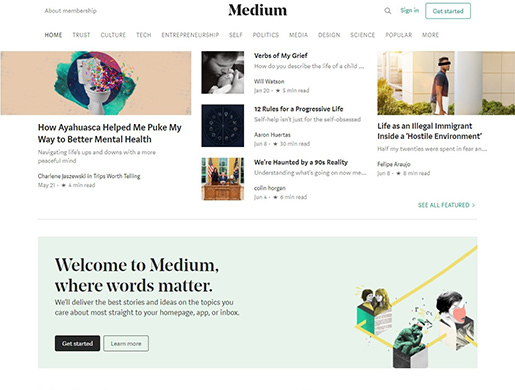 Medium is one of the fast-growing online publishing platforms that allows any users to create stories and post them on their own personal web space. So if you are looking for a blogging alternative for WordPress, this is a pretty good option. It is easy to use, understand and also features built-in social networking feature. Although branding and promoting is not the ideal purpose at Medium, if you are simply looking to share contents then it is a great platform. Of course here, users lack the flexibility and the control over a specific content or profile. It is widely popular and the WordPress Gutenberg editor is also inspired by the Medium post editor. And if you are looking to reach out to a wider range of audience, then Medium wins it hands down. While WordPress has a large range of users overall, Medium has an average of 60 million blog readers per month. This alongside other awesome features makes it an awesome blogging alternative for WordPress. While it is perfect to blog, there are also certain drawbacks, so let’s take a look at them. Larger range of audience and possible exposure and views for your work. The content management system of Medium is pretty decent and easy to work with. Medium generates tons of backlinks on a regula basis with great content making it more liable to rank higer on SERPs. Strategically placed social media sharing elements that draw in more traffic. Limited control over the ownership of their work compared to WordPress. Less potential for generating high-quality leads. Fewer access to the analytics of your contents. In a nutshell, Medium helps your contents reach out to a larger audience and getting more exposure. If you are focused entirely on content publishing or blogging, then Medium is the ideal WordPrss alternative. When it comes to WordPress, an all-in-one platform for website creation, blogging, content management and more, there are very few that competes. That being said, it has its advantages and disadvantages. Especially when it comes to a specific purpose focused project or site creation, sometimes less is more. And although WordPress is the first choice of millions all over the world, sometimes we cannot help but wonder, are there any alternatives? Well, there are plenty in the cut-throat internet. However today we have enlisted the best ones that we thought would help our users out to decide! Simplifying the process, and saving the time and effort to compare each one out, feel free to check out our list of best alternatives for WordPress for each and every niche and purpose! Liked our article? Found it helpful? We always love feedback! Do let us know down in the comment section below! And now that you are here anyway, why not check out more of our blogs posts where we talk about the comparisons in-depth? WordPress Vs Blogger Vs Wix: Top 3 Blogging Platforms Compared! Wix Vs Weebly Vs Squarespace Vs GoDaddy Vs Jimdo Vs WordPress! Your content is very beneficial. Thank you so much for sharing. I think it depends on user need and expertizes that determines which CMS is best for their need, I like this info very useful .thanks for it. Your Blog is very beneficial and helpful. Thank you so much for sharing this valuable information. This blog is much relevant for my subject and it helped me a lot and it will be much beneficial for experts, too.